Macarthur, a rural township in western Victoria, is about midway between Hamilton and Port Fairy. The town is situated on the Eumeralla River, where the Eumeralla pastoral run (1842) was settled. 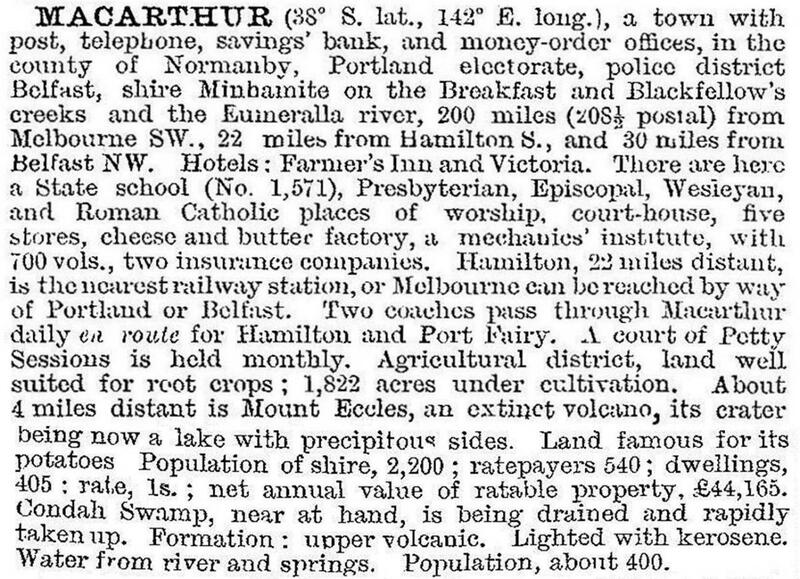 A track was made between Port Fairy and Hamilton and a settlement formed where it crossed the river at a convenient fording place. It was named after Sir Edward Macarthur, administrator of Victoria in 1856, between the governorships of Hotham and Barkly. The Eumeralla Inn was opened in 1852, or some time before. The land around the fording place had fertile soil from the Mount Eccles volcanic source and it was attractive to small farm-holders during the 1860s. A Presbyterian school was opened in 1865. A further boost to Macarthur’s population came with the subdivision of the surviving Eumeralla estate in 1911, bringing the population to a peak figure. Macarthur’s further growth was arrested by the development of Hawkesdale, which after years of wrangling between the two towns succeeded in becoming the administrative centre of Minhamite shire. Both areas’ rural populations grew from soldier-settlement farms after World War I, and Hawkesdale more so after World War II. The influx of soldier settlers after World War II coincided with rising or stable primary-production prices, and the use of subterranean clover and superphosphate to enlarge carrying capacities. Drainage works reduced flooding from the Eumeralla River. During the 1950s and 1960s Macarthur gained an infant welfare centre, a new hospital and a swimming pool (but Hawkesdale gained the district high school and enlarged shire offices). Macarthur has a golf course, a recreation reserve, bowling, tennis and swimming facilities, a community health/outreach service, a public hall and Anglican, Catholic and Uniting churches. The shopping centre includes a hotel. The former court house (c1892) is heritage-listed. The primary school had 72 pupils in 2014. Despite some local opposition, in 2013 the largest wind farm in the southern hemisphere opened at Macarthur, with 140 turbines to generate enough electricity to power over a quarter of a million average households in Victoria.